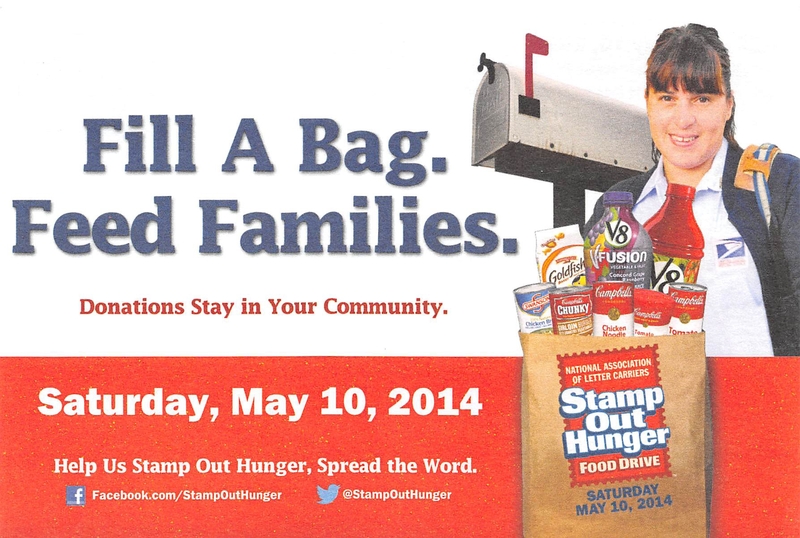 Stamp Out Hunger this Saturday May 10th! On Saturday, May 10, the National Association of Letter Carriers’ Food Drive will once again spread out across America to help provide assistance to Americans who are struggling with hunger. Now in its 22nd year, the Food Drive effort is the nation’s largest single-day drive. In 2013, 74.4 million pounds of food was collected, which brought the grand total of donations to just under 1.3 billion pounds of food collected over the history of the drive. The need for food assistance remains a problem in America. All you have to do to participate is place a bag of non-perishable food items out by your mailbox this Saturday for your letter carrier to pick up and it will be delivered to a local food bank or pantry.